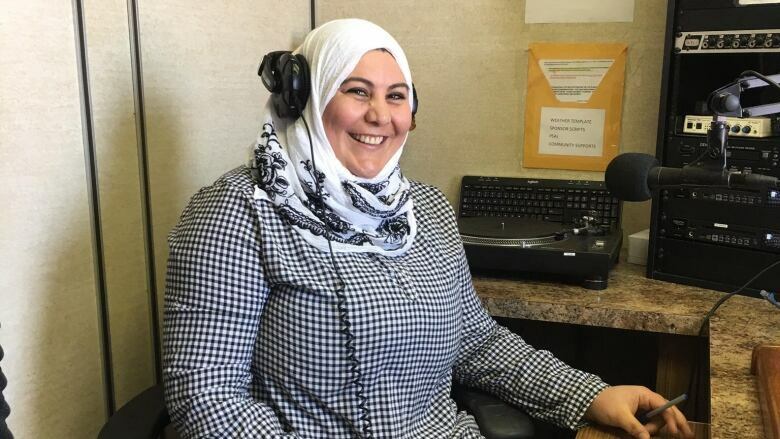 Naeila AlShatir has a one-hour show every Saturday on CJTR. Naeila AlShatir, like so many others, fled the war in Syria in search of a life not tainted by war. Before conflict erupted in the now war-torn country, AlShatir studied English literature, taught high school and received a master's degree in psychosocial studies. First, she went to Jordan, the country which borders Syria to the south. Then, in May 2016, she arrived in Regina. She works at the Open Door Society. AlShatir knew there were other refugees in Regina who may not speak very much English but would want to know what was going on in the city nonetheless. So she started her own radio show in Arabic. The show is called Alhawa Araby and it's on CJTR every Sunday from 11 a.m. to 12 p.m. CST. "I focus on life," she said. The show gives a rundown of current events and things happening in and around the city. It plays music and has guests. For example, AlShatir recently talked about the Women's March and Scott Moe's election as premier. She said she picks her music so it will appeal to a wide base of people. "I choose my songs from many countries — from Iraq, from Syria, from Lebanon, from Egypt — to engage many people to listen to my radio," she said. A goal of hers is to comfort people with the familiarity of the show. As for how she picks her news, AlShatir said she wants to focus on positivity. "I choose the news which is optimistic. ... We [don't] avoid everything, but I focus on things which gives them resources." Bringing a community together is a common theme with AlShatir. She said her listeners have given her positive feedback since the beginning. "The first time, they were very [happy] to hear Arabic, that they [felt] 'we are part of this community.'"